perfect for late-summer & autumn colour. Supplied as an established plant in a 2L pot, tied in to a 1m tall cane, to plant out any time. 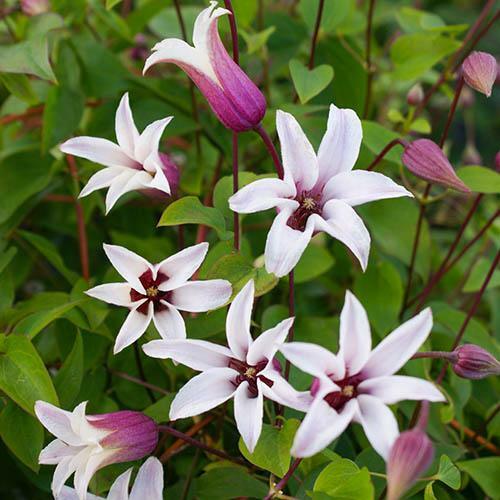 A divine and elegant autumn flowering Clematis from the late flowering ‘Texensis’ species, Clematis ‘Princess Kate' produces an abundance of semi-upright, waxy bell-shaped pink flowers from August to October, reliably, every year. What’s really special about ‘Princess Kate' is that it brings beautiful, bright colour to the garden when all else is fading. Noted for its unusual colour, the semi-upright blooms are white on the inside and a glorious dark pink with a white margin on the outside. The colourful trumpet-like flowers will bring your garden to life as they attract beneficial pollinators and wildlife as the blooms smother supports and structures. It’s an ideal variety growing up a trellis or obelisk, covering unsightly walls and fences while elevating floral displays and creating that wonderful secret garden feel. You could also train this clematis to scramble through shrubs and trees, letting it ramble through its neighbours! ‘Princess Kate' is fully hardy and easy to manage as it is not an over vigorous variety and it responds well to a hard pruning in spring which will encourage even more blooms through the autumn. Pruning is a case of a simple tidy up - in late winter/early spring simply reduce all stems down to soil level.